This is another recipe that came from a craving. I used to make salmon patties all the time and really missed them, so I tried to make something that was similar. The kids called them sea cakes because I replaced the fish with seaweed. I ground nori sushi wrappers in my spice grinder to get the seafood flavor. I know it sounds a little crazy, but they are delicious. Nori is easy to find in most grocery store, just look in the asian section. The main ingredient is mashed potatoes with some carrots and onions for a little flavor and texture. 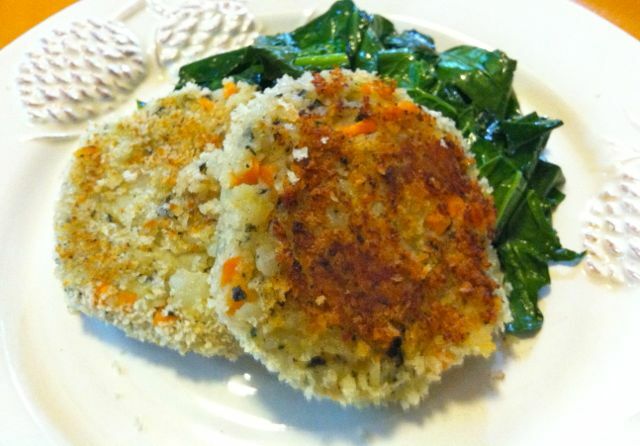 The panko bread crumbs give them a nice crispy outside. If you like seafood, these are must try. Bring a large pot of water to a boil. Peel and dice the potatoes then boil them until they are tender, about 10 minutes. Drain and put in a large bowl, set aside to cool. While the potatoes are boiling cook the carrots and onions. In a medium skillet, heat the oil over medium heat. Add in the carrots and the onions and cook about 8-10 minutes until they are tender. Set them aside to cool. When the potatoes are cool enough to handle mash them up. Tear up the Nori a little and put it in a spice grinder or food processor. Grind it until it is finely chopped, but not powder. Add the nori, carrots and onions, salt, pepper and seasoning to the mash potatoes. Mix it all together thoroughly. Form the potato mixer into patties. (If it is a little too dry add in a little soy milk.) Coat the patties in the bread crumbs. Heat another 2 TBSP of oil on a griddle or in a large skillet. Cook the sea cakes about 5 minutes on each side until they are nicely browned.